Today Google announced several new devices at their September 2015 launch event in San Francisco. By far the most anticipated devices were the two new Nexus phones that were announced. 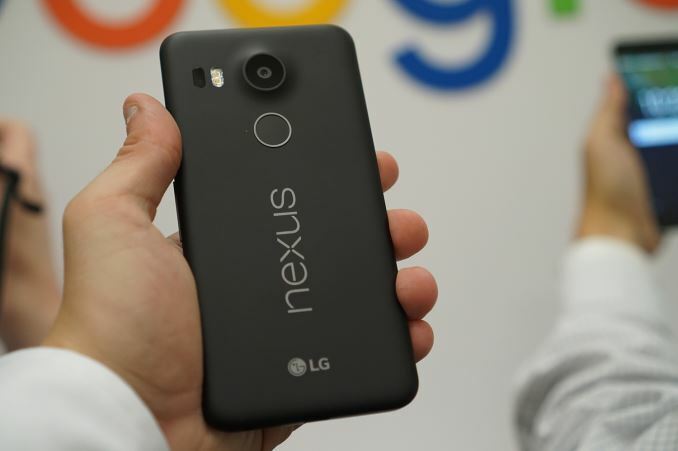 The first is the Nexus 5X made by LG, a successor to the Nexus 5 which was released nearly two years ago in late 2013. The second is the Nexus 6P, which is made by Huawei and replaces the existing Nexus 6 made by Motorola. Both of these phones bring significant improvements over their predecessors, particularly the Nexus 5X which can take advantage of all the advancements made in the past two years. Below you can see the specifications for each of these new devices along with the specs of their predecessors to see how they compare. 5MP, F/2.0, 1.4µm Rear Facing 13MP, 1/3.06" (Sony IMX214), F/2.0. The Nexus 5X is similar to the Nexus 5 in some ways but different in others. The chassis is noticably thinner, although the camera protrudes a fairly significant amount. The device has gotten larger in the other dimensions as a result of its larger display. However, it's not that much larger, and during my time with it I never felt that it was difficult to hold. The SoC moves from Qualcomm's Snapdragon 800 to Snapdragon 808, with the amount of RAM and internal NAND remaining the same. The battery capacity receives a significant bump, going from 8.74Wh to 10.26Wh. As for the camera, it's greatly improved. The Nexus 5 was never known for having an amazing camera, and with these new Nexus phones Google appears to have implemented a custom camera sensor. It's a 12.3MP sensor with 1.55 micron pixels, which roughly equates to a 1/2.3" sensor format. The back of the Nexus 5X feels similar to the material used in the black Nexus 5. There's also a blue model and a white model, and while I didn't get to try the white model the blue version seemed to have the same texture as the black one. The design of the phone diverges significantly from the appearance of the Nexus 5. There's no more raised black ring around the camera, which makes the current Nexus 9 a bit of a loner as it's the only device left that has that design accent. The camera has also been moved to the center of the back, while on the Nexus 5 it was situated in the upper corner. Something worth noting is that the Nexus 5X and 6P both lack OIS, something that existed on their predecessors. Google's rationale is that you won't need long exposures as the camera sensor and pixel size is large enough to work well without it. Whether or not that is true remains to be seen, but OIS is still a useful feature and I think many users who are hoping to upgrade from an existing Nexus smartphone will be sad to see it gone. On the software side, Android Marshmallow has a significantly improved camera app. Google has addressed many of the issues with menus and settings being difficult to find, and I also noticed that the camera preview frame rate on the Nexus 5X and 6P was much higher than on the Nexus 5 and 6. Below the camera is Google's new fingerprint sensor. According to Google it can recognize a finger in under 600ms and has a very low error rate. It's difficult to say how it compares to other devices, and I wasn't able to get time to use it, so that will have to wait for when we actually review the Nexus 5X. The position on the back seems to be well chosen, and because it also will wake up the phone it doesn't suffer from the issue with some early rear-mounted fingerprint scanners which is that you had to wake the device first. As for the front of the phone, there's not a whole lot to say. It's dominated by the display, with the earpiece on the top and a single speaker on the bottom and a front-facing camera to the left of the top speaker. The display itself seemed very good, and the color rendition looked similar to the Nexus 5 which is a good sign. While the Nexus 6P has an AMOLED display, the Nexus 5X is an IPS LCD. Next is the Huawei-made Nexus 6P. Every aspect of the device feels like a large improvement over the Nexus 6. The first thing that stood out to me is the size. The Nexus 6 was extremely large and I couldn't hold it properly in really any circumstance. The Nexus 6P takes a step back to a 5.7" display, and the dimensions of the phone itself are not much larger than the iPhone 6s Plus despite the larger screen. Of course, you end up losing some real estate to the on screen buttons while the iPhone has a physical home button, but the point is that the phone is much easier to hold and use than the Nexus 6 was. The thickness also contributes to this as well, as the Nexus 6P is almost 3mm thinner than the Nexus 6. Beyond the dimensions, the construction and feel of the phone is miles ahead of the Nexus 6. It's an aluminum unibody construction with a diamond cut edge edge, and the primarily plastic construction of the Nexus 6 isn't even remotely comparable. It's also fairly light considering the aluminum build and its size. Something worth noting is that Google seems to have given Huawei and LG a lot of freedom when designing these new phones. The Nexus 5X doesn't share many visual characteristics with the 6P apart from the Nexus logo on the back and the fingerprint scanner. Rather than mounting the camera in the middle, Huawei has put it in the upper left corner like the old Nexus 5 did. The entire top of the back also has a slightly raised black bar. I'm honestly not a fan of this, as it just interrupts what should be a continuous aluminum surface. Like the Nexus 5X, there's not a whole lot to say about the front of the Nexus 6P. It has stereo speakers, a front-facing camera, and a large display. The 6P bumps the front camera resolution up to 8MP from the 5X's 5MP, with a corresponding increase in sensor size to maintain the 1.4 micron pixel size. The display is the part of the Nexus 6P that I was most curious about. The Nexus 5 was notable for having a very accurate display despite its low price, and with the Nexus 7 also having accurate calibration it was hoped that Google would continue this across all of their products. Unfortunately, the Nexus 6 shipped with a very poorly calibrated AMOLED display with low brightness. When I first used the Nexus 6P I was very upset to see that it was clearly oversaturated like the Nexus 6, but there's more to the story this time around. In the Nexus 6P's developer settings there is a switch to enable an sRGB mode, and when this switch is turned on the Nexus 6P's display appears to have similar color rendition to the Nexus 5X which is a very good sign. While we'll need to get a review unit in order to analyze all of the display's attributes, I am hopeful that Google has recognized and fixed the issues with the Nexus 6's display in the Nexus 6P. On the top of the Nexus 6P you'll find a 3.5mm audio jack, whereas you'll have to move to the bottom to find it on the Nexus 5X. However what you won't find on the bottom of either Nexus phone is a USB Micro-B port; Google has decided to be forward looking, and like the Chromebook Pixel the new Nexus smartphones use the USB Type-C connector for data and charging. While this will come with some pain in the short run as users won't be able to use existing USB Micro-B cords, I think the benefits are worth it. Both new Nexus devices also come with the new Android Sensor Hub. This essentially refers to the different sensors that the devices include, and how they are now controlled and managed by a dedicated processor rather than the device's application processor. This is important for features like Doze in Android Marshmallow, as it allows Google to use minimal power to check the status of sensors and determine whether or not to go into deep sleep. For me personally, the Nexus 5X is the most interesting of Google's two new Nexus phones. I always like to see what vendors can do when they're targeting a price far less than that of a flagship smartphone. The Nexus 6P definitely has its appeal too though, and we'll be running both of them through our standard suite of tests in order to see how they compare to the competition. If you're already convinced that you want the Nexus 5X or 6P you can pre-order them online now from the Google Store so long as you live in the US, UK, Canada, Japan, or Ireland. The Nexus 5X starts at $379 and comes in black, white, and blue, while the Nexus 6P starts at $499 and comes in standard aluminum, white, and black. Users of all Galaxy Note 5, S6, S6 Edge and Edge+: Any Samsung device on 5.X.X TouchWiz behaves like a device with 1gb RAM (And I have compared some) thanks to memory leak + buggy RAM management. Devices with 2gb RAM and no TouchWiz perform better.